Then comes mutt/contacts/search, which can read these backups from $HOME/.mutt/contacts/ (you can create symlinks to decide which backup should be included in the search results). The rest is just a short search.vim that integrates the search script into vim, so when mutt starts it with ft=mail, the search script is invoked when you start typing and you press Ctrl-X Ctrl-O (trigger code completion). And that’s it, I can start typing mails to friends and customers even without network connectivity, without manually maintaining an own address book just for mutt! Background: I was benchmarking Online vs jodconverter vs unoconv the other day for Collabora’s document conversion page. 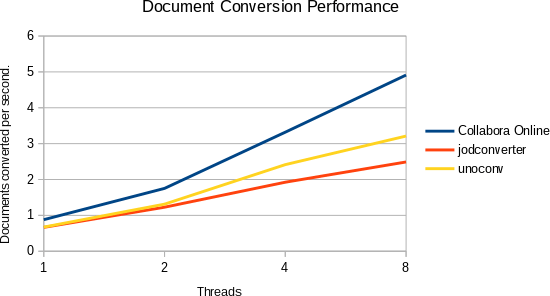 One problem with measuring unoconv performance was that it provided no ways to run multiple unoconv processes in parallel, while the underlying soffice binary obviously allows this. So while unoconv is not capable of launching the soffice process in a chroot (improves security), nor is capable of forking an already pre-initialized soffice process (improves performance, both are things Online can do for you), there is no real reason why you should not be able to run multiple unoconv processes in parallel. The previously mentioned benchmarking would be quite unfair if even this kind of multiprocessing would be ignored, but unoconv had no way to specify a custom user profile, which has to be different for each soffice process. So I filed a GitHub pull request on 1st Jun, and finally it was merged on 10th Aug.
It’s your responsibility to give --port a unique value, but that’s not too hard: if you use a thread pool to launch the unoconv processes, then you can add the thread index to a base port and that will give you a unique port. 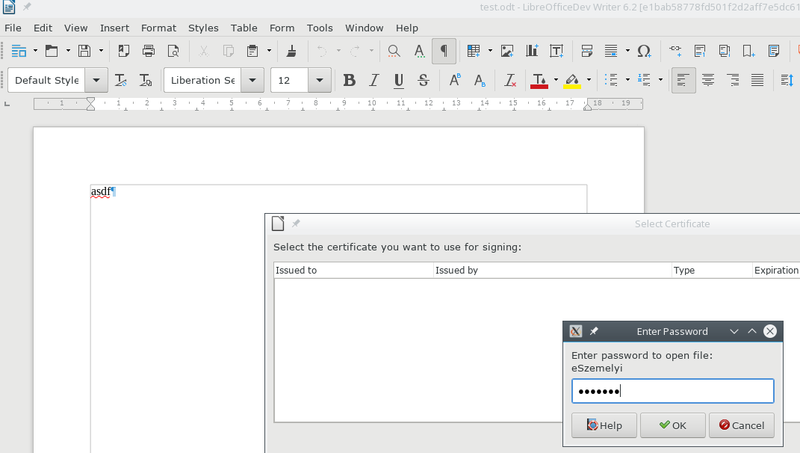 I wrote about ECDSA handling in LibreOffice last year, back then the target was to be able to verify signatures using the ECDSA algorithm on Linux. Finally now that everything is ported on Windows to use CNG, I could enable it by default yesterday. Thanks Gabor Kelemen who helped me to get a sane card reader that has reasonable driver support on Linux. I worked on a small feature to use Writer as an editor for the XHTML fragments inside Requirements Interchange Format (ReqIF) files. First, thanks to Vector for funding Collabora to make this possible. Writer already supported XHTML import and export before (see my previous post) as a special mode of the HTML filter, this work builds on top of that. The main speciality around XHTML as used for fragments inside a ReqIF file is embedded objects. during export: -convert-to "xhtml:HTML (StarWriter):xhtmlns=reqif-xhtml"
Image with native data we don’t understand and just preserve. 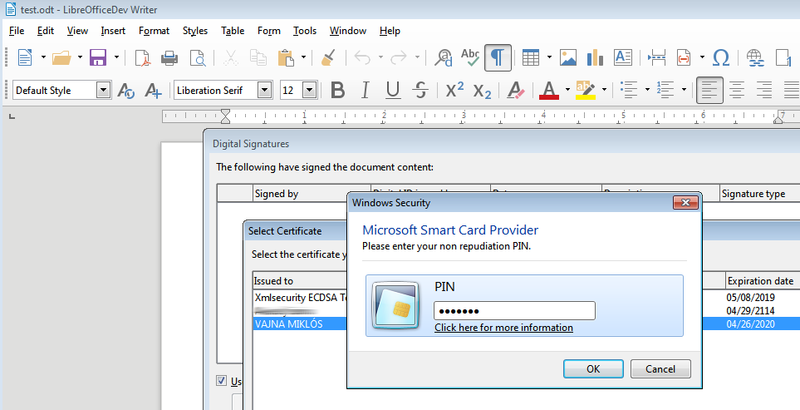 Image with OLE2 data, which we hand out to external applications (at least on Windows). On the above video this is an embedded PPSX file, handled by PowerPoint. Image with ODF data, which we handle internally. This is a Draw document on the above video. Larger ReqIF files have the .reqifz extension, and are ZIP files containing an XML file, having the XHTML fragments. 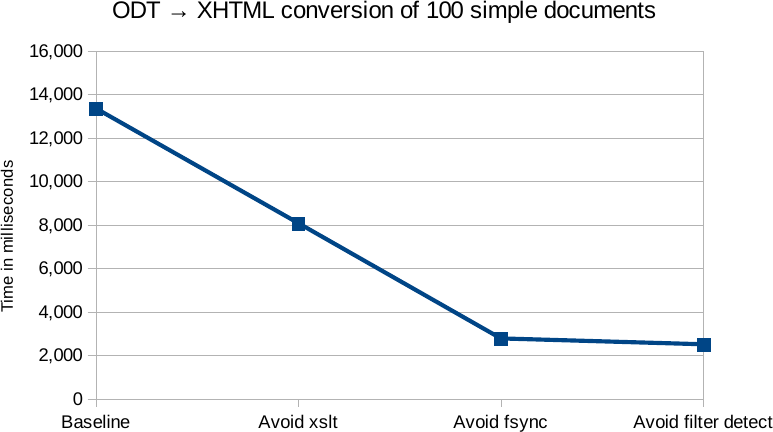 This is not relevant for this post, as Writer assumes that extracting the XHTML fragment from ReqIF is done before you load the content into Writer. XHTML always has a PNG image for the object, and optionally it has RTF as native data for the object. The RTF file is a fragment, containing just an embedded OLE1 container. The OLE1 container is just a wrapper around the real OLE2 container. The OLE2 container either has the data directly or MSO has a convention on how to include OOXML files in it (see the PPSX example above), and we handle that. On export we do the opposite: save the file, put it into OLE2, then into OLE1, then into RTF, finally into XHTML. There is no specification on how to put ODF files into OLE2, so I extracted the relevant code from LibreOffice’s binary MSO filters and now the Writer HTML filter uses that as well. This avoids code duplication and also could avoid inventing some new markup this way. 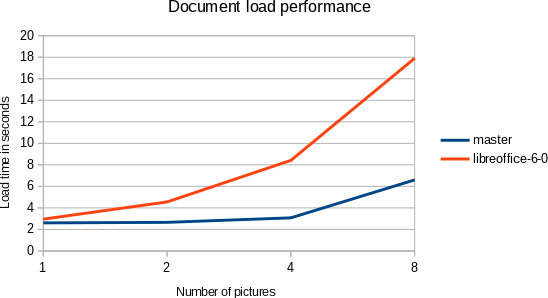 I worked on improving document load performance of Microsoft formats in general, and DOC/DOCX in particular in LibreOffice recently. First, thanks to TDF and users that support the foundation by providing donations for funding Collabora to make this possible. I built on top of the great work of Tomaz, focusing on these secondary, but important formats. The idea is that if you load an Microsoft binary or OOXML file, it should not be necessary to parse all images at load time, it’s enough to lazy read it when we first render e.g. a Writer page containing that image. The focus here was documents containing large images. I tested with an Earth photo of size 8000x8000 pixels from NASA, making little modifications to it, so each picture has a different checksum, embedding them into a binary DOC file. I measured the time from the soffice process startup to rendering the first page. 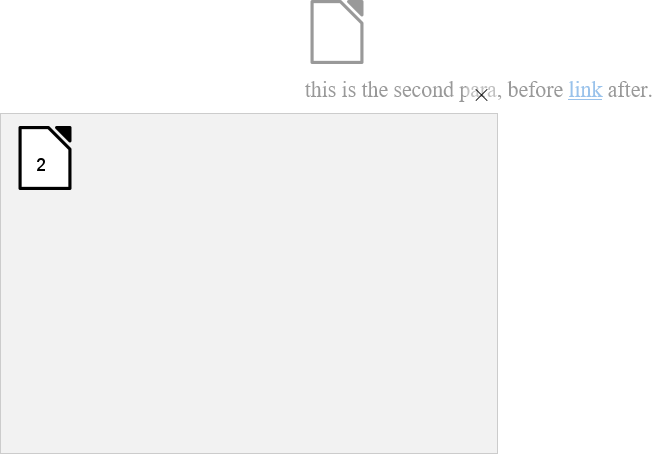 We defer the work of loading most images now, as you can see on the chart. In contrast, we used to decompress all images on file import in the past. This means the new cost for e.g. 4 images is 37% of the original. 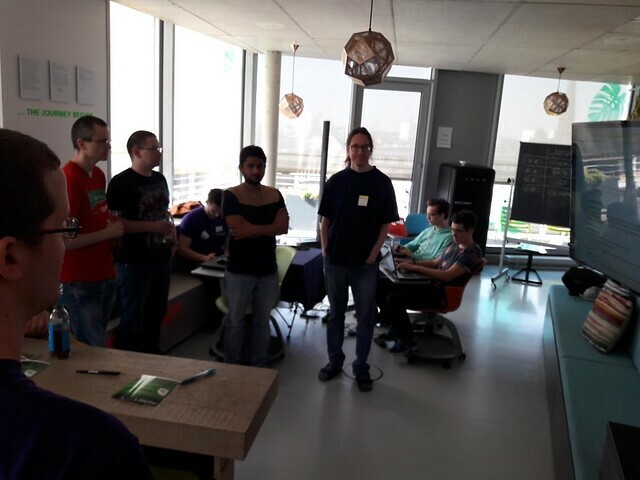 I arrived home from Hamburg yesterday where I participated in the LibreOffice hackfest over the weekend as a mentor. First, thanks to The Document Foundation — and all the donors for funding Collabora to make this possible. Patrick was interested fixing tdf#116486, which required some background knowledge on the Writer document model and layout, so we explored the relevant details together towards providing an actual patch for the bug. Nithin wanted to fix tdf#112384, which turned out to be an ideal task for a hackfest. On one hand, the scope is limited so that you can implement this mini-feature over a weekened. On the other hand, it required touching various parts of Writer (UI, document model, UNO API, ODF filter), so it allowed seeing the process of adding a new feature. The patch is merged to master. Linus looked for a task that is relatively easy, still useful, we looked at tdf#42949, and he identified and removed a number of unused includes himself. This should especially help with slow incremental builds. Again, the patch is already in master. Zdeněk (raal) wanted to write a uitest for tdf#106280 so we were figuring out together how to select images from pyuno and how to avoid using graphic URLs in uitests in general. Finally, thanks for the organizers and the sponsors of the hackfest, it was a really great event! 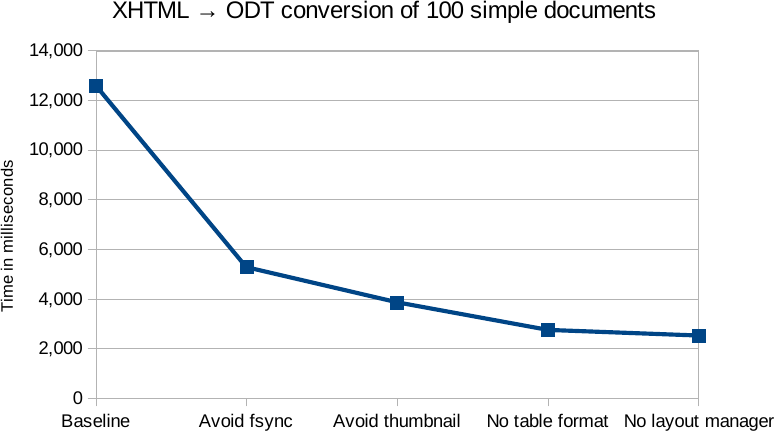 I worked on improving the ODT ↔ XHTML conversion performance for simple documents in LibreOffice recently. First, thanks to Vector for funding Collabora to make this possible. The focus here was really simple documents, like just one sentence with minimal formatting. The use-case is to have thousands of these simple documents, only a minority containing complex formatting, the rest is just that simple. Performance work usually focuses on one specific complex feature, e.g. lots of bookmarks, lots of document-level user-defined metadata, and so on — this way there were room for improvements when it comes to trivial documents. Recognize XHTML as a value for the FilterOptions key in the HTML (StarWriter) export filter, this way avoid the need to go via XSLT, which would be expensive. Add a new NoFileSync flag to the frame::XStorable::storeToURL() API, so that if you know you’ll read the result after the conversion finished, you can avoid an expensive fsync() call for each and every file, which helps HDDs a lot, while means no overhead for SSDs. If you know your input format already, then specifying an explicit FilterName key for the frame::XComponentLoader::loadComponentFromURL() API helps not spending time to detect the file format you already know. Note that the XHTML mode for the Writer HTML export is still a work in progress, but it already produces valid output for such simple documents. The new NoFileSync flag, as mentioned previously. A new NoThumbnail flag, which is useful if the ODT will be part of a next step in the pipeline and you know that the thumbnail image won’t be used anyway. A new HiddenForConversion flag for frame::XComponentLoader::loadComponentFromURL(), which means we don’t lay out the UI elements (toolbars, sidebar, status bar, etc.) when we know the purpose of the document load is only to save the document model in an other format. Quite some other slides will be available on Planet I expect, don’t miss them. 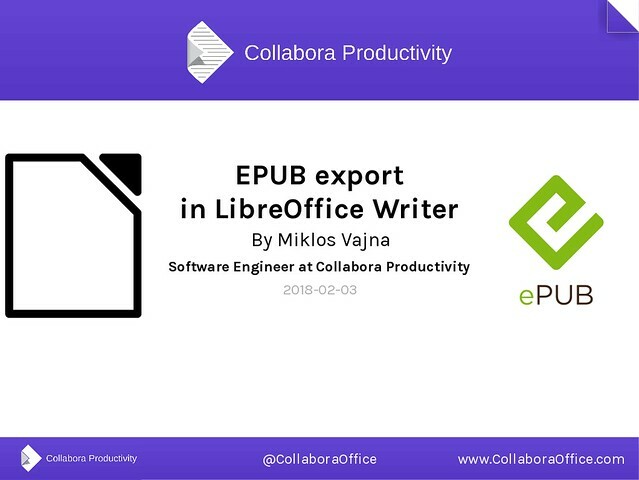 I worked on improving the EPUB3 export filter in LibreOffice further recently. First, thanks to Nou&Off in cooperation with a customer who made this work possible. Since the previous blog entry there have been a number of improvements around a next set of topics. It is now possible to specify a cover image for the exported EPUB file. Given that a cover image is not naturally part of the Writer document model, I introduced the concept of a media directory for the EPUB export. The media directory is a directory next to the source file, with the <file name without extension> name. If that directory contains a file named cover.svg (or .gif, .jpg, .png), the exporter will automatically use it. Otherwise you can customize this default. 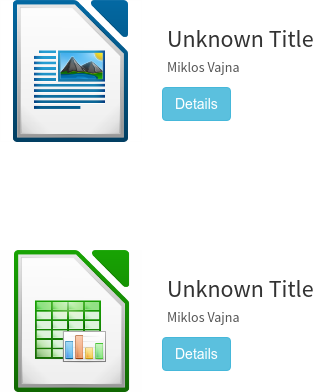 The picture shows two EPUB files in Readium with different cover images. It’s quite frequent that you are technically author of a document, but the logical author of the book is somebody else. Same for the date of the book, and so on. So the EPUB export dialog now has support for overwriting the defaults coming from the Writer document model. For mass-conversion of documents it’s possible to place a <file name without extension>.xmp file in the media directory and XMP metadata from that file will also overwrite metadata coming from the document model. 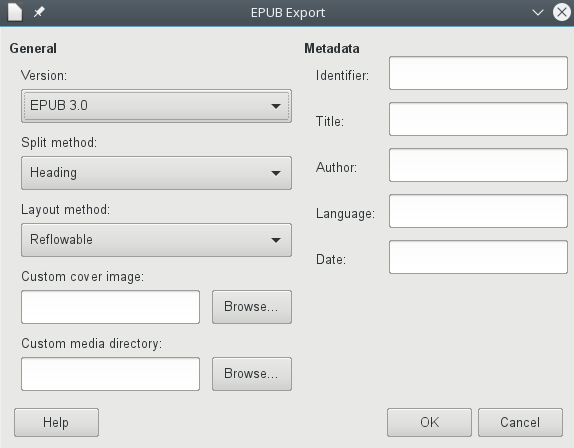 The picture shows the extended EPUB export options dialog. I’ve added support for footnotes. As a special case of this, image popups on images and text is now supported. This works by placing a relative link on a text portion or on an image, and placing an image with the same name (e.g. in high resolution) in the media directory. 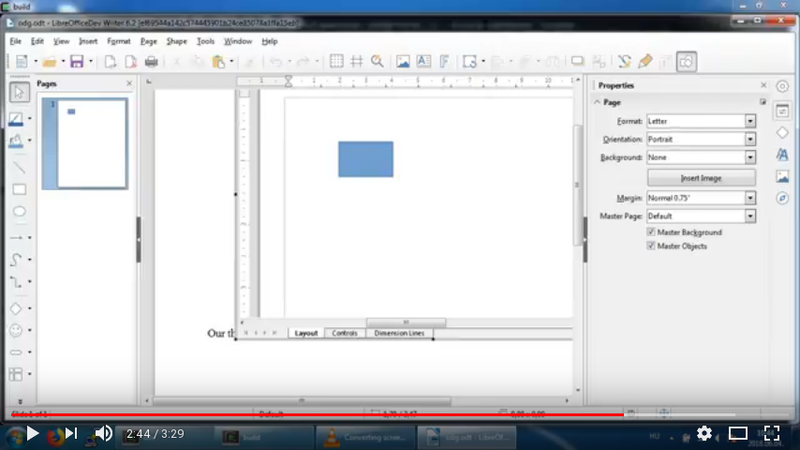 In this case the EPUB export will bundle the image from the media directory inside the EPUB file and clicking on the text or image will open the bundled image in a popup (or in some other container, depending on how your reader interprets footnotes). The picture shows such a popup in Microsoft Edge. These might be very specific situations, but luckily supporting them is not too complex. I implemented an approach very similar to the PDF export, where we export individual pages of the Writer document’s layout as a metafile, and then consume that — this time with the SVG export. Building on top of the existing Writer layout and SVG export means the hard work is really done by these components, the EPUB fixed layout export just puts these together. 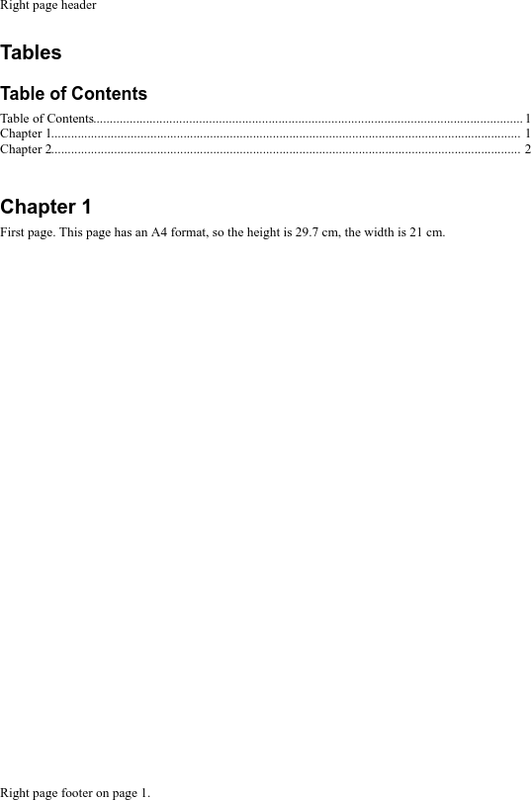 The picture shows a Writer document with a table of contents containing page numbers, a header and a footer in Readium.